There are lots of things to explore when we’re talking about hair loss. One of these is about hair follicles, the anchor from which each hair grows. Stimulating hair follicles means stimulating hair growth. Some studies are going to look for the most effective ways to stimulate hair follicles, especially for cases in which hair loss can be permanent (such as androgenetic alopecia, the most common type of hair loss in men and women). 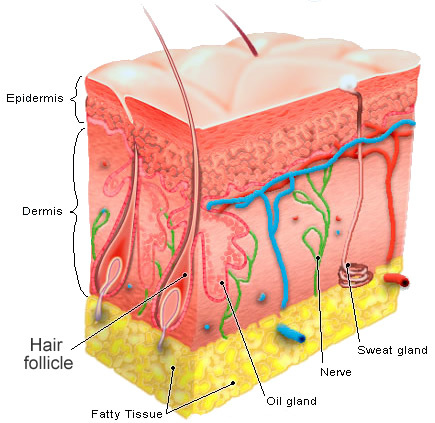 Hair follicles are important structures of the skin where hair grows. They are not only found in the scalp, but also all over the skin. However, there are also some parts of the body without hair growth; these include sole of feet, palm of hands, and lips. Hair shaft what you see is actually composed by dead cells. Yap, it is dead and therefore it doesn’t hurt when you cut it. It grows from the root (bottom of follicle), made up of the rapidly growth of cells of protein. Blood vessels in the scalp carry blood to feed the root. As new cells are produced and grow – other cells mature, die, and pushed along the follicle towards the scalp, and you notice hair growth. These cells die by the time it pokes out the skin. As hair grows, it also passes oil gland along the way. As the name suggests, this oil gland produces oil to help keep hair shaft soft and shinny. But it can cause greasy, too – therefore, you need to wash or shampoo your hair. Each follicle grows hair that passes three main-phase cycles. The period when hair grows actively is called anagen, this can last for years (about 3-7 years). Hair usually grows about 0.5 -1 inch per month, this varies between people. In the end of anagen phase, hair starts to shrink and grow more slowly. This is what we call as transition phase or catagen that typically last several weeks. Then the transition phase is followed by resting phase or tellogen (when hair stops growing). Eventually, old hair falls out and replaced by new hair growth (another anagen phase starts). At any given time, most of hair follicles are going with anagen phase. And a few amounts of them go with catagen and tellogen phases. Therefore, it’s normal to notice about 50-100 of hairs that fall off from your scalp every day. Even you may not notice this since other hairs keep growing! Most people are born with all of hair follicles that they will have. This varies, about 5 million on average. In other words, there are usually no new hair follicles during your life – or the number of follicles on the day you were born is not different as you have today. Therefore, it’s important to take good care of them! On the scalp, there are about 100,000 hair follicles (and this also can vary from person to person). Men’s hairs are likely to grow more quickly than women’s hairs. Hair is composed by cells that grow quickly (the fastest growing cells of the body, after bone marrow). However, hair also takes a while to become it really long (about 6 inches per year, on average). Since it can vary for hair follicles to grow hair (they don’t all grow hair at the same time), again it’s normal to lose about 50-10 strands of hair every day! As we age, there will be more hair follicles in the scalp that stop growing hair. In some people, this occurs more, causing thinning hair or even baldness. This is dependent on the cause of the problem. And there are many different factors and causes that can affect hair follicles, from lifestyle factors to serious conditions (such as hereditary pattern baldness, scalp infection, or if it is linked to certain medical problem). However it’s not always easy to determine the exact underlying cause. But at least you need to know the type of your hair loss in order to determine the most appropriate treatment. In some cases, hair follicle damage can be permanent and hair growth is almost impossible. For instance, if there is already scaring of bald spot, hair loss is likely to be permanent. In other cases, the problem is mild and relative easier to treat. There are lots of posts and articles discussing effective ways to treat follicles. Unfortunately, it’s not easy to draw the line between ‘a waste of time’ and ‘sound advice’. Here are some helpful explanations to understand the real possibilities of how to stimulate hair follicles. What you eat does have an effect on your follicles. Like other cells in the body, your follicle and hair also require good, regular nourishment. These nutrients include protein, minerals, and vitamins. The impact of particular nutrient deficiency on your hair doesn’t occur immediately. It takes a few weeks or even months before eventually you notice the symptom. Telogen effluvium is one of common hair loss problems associated with lifestyle factors, including poor diet or lack of particular nutrient. It is a condition of when many hairs go into tellogen phase at the same time. As a result, you can see a significant hair loss such as in the shower. Other causes include stress, major surgery, giving birth, and severe infection. The good news, it is reversible and relatively easier to treat. It usually improves once the underlying cause is addressed. Even in some cases, it will improve spontaneously (such as when it is associated with giving birth). Nowadays, there are numerous different hair loss treatment options to choose from. But in fact none are a substitution for preventing hair loss in the first place by nourishing your hair and follicle through proper nutrition. If you are suffering from hair loss associated with particular nutrient deficiency, some supplements are available to help cope with. Which one you should choose and do they really work? Explore more in this section! At first, it was not used for hair loss treatment. It belongs to medicine called vasodilators to help widen blood vessels. But today it’s approved for hair loss treatment. Even, it is the first medicine approved by FDA for pattern hair loss (androgenetic alopecia, male pattern baldness for men and female pattern baldness for women). The way of how it works in stimulating follicles and treating hair loss is not fully known. There is also no any adequate explanation about the link between any vasodilator and hair growth. Most women with female pattern baldness find that it works to help coping with the problem. But NOT for men! While some men find benefit with this treatment, others don’t. Mostly, it doesn’t work for receding hairline (a common early sign of male pattern baldness). 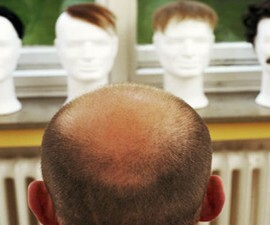 But it may work for thinning hair on the crown (another symptom of male pattern baldness). See more facts about Rogaine or Minoxidil in this previous post! It is the second treatment approved by FDA for treating male pattern baldness. But it is the first treatment that can treat male pattern baldness effectively – yap, it works better than Minoxidil. In most men with pattern baldness, their follicles are usually more sensitive to the activity of androgen hormone, particularly one called DHT or dihydrotestosterone. With more DHT in the scalp, the growing (anagen) phase goes shorter, from years to only a few months. And propecia can help reduce DHT in the scalp. This is the key of why it is considered more effective than Minoxidil. But it seems propecia doesn’t work for women with female pattern baldness. Even now it’s clear that female pattern baldness has nothing to do with DHT. Learn more about propecia in this previous article! This option may be suggested if you are looking for permanent result of your treatment. Both propecia and minoxidil can only provide temporary result. You need to take them continuously. Because if you stop taking them, hair loss is likely to return! Hair transplant is actually not used to stimulate follicle. Like other transplantations, it moves healthy follicles from other areas of the scalp to particular area where hair growth is expected. Therefore, you need to have a stable donor site! To avoid the wrong choice of choosing donor site, it’s usually recommended to not take hair transplant at too young age. Most men with androgenetic alopecia can take conventional hair transplant treatment – but NOT for women! As well we know, androgenetic alopecia in women usually causes thinning hair all over the scalp. As a result, there is no adequate donor site for hair transplantation. But there is a game changer for those who are not able to take conventional hair transplant surgeries. This is the use of stem cells for hair growth. Again, the number of hair follicles what we have today is not different than on the day we were born. If some die (permanent hair loss) as you age, your body will not make new follicles to replace them. Can B12 Deficiency Cause Hair Loss? Causes of Thinning Hair in Men Younger than 30! Seasonal Shedding Hair in Summer or Winter!